The NYC BBQ Cookoff is held annually at Historic Richmond Town in Staten Island. 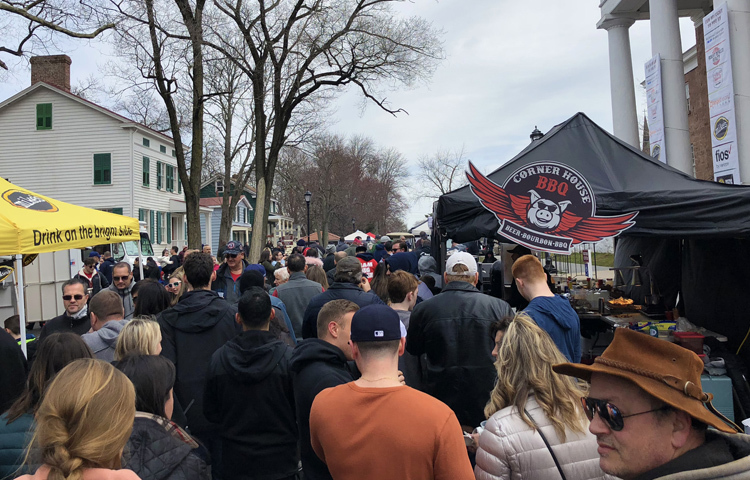 One of the lesser-known-but-still-good barbecue events that happens each year in the New York City metro is the NYC BBQ Cookoff at Historic Richmond Town in Staten Island. This year’s NYC BBQ Cookoff is happening Saturday, April 6 and provides some family fun and an opportunity for barbecue enthusiasts to see intense competition barbecue up close. The event, which costs $15 for adults and draws thousands of people, consists mostly of walking around Historic Richmond Town and getting face time with barbecue teams and sampling their food. There are 35 competition teams this year that will be cooking on site, including top teams like Smokin' Hoggz BBQ and Top Gun Barbecue. Keep in mind that the samples are on the small side, so you’re not going to necessarily get full from them. There are also vendors selling a variety of food, including larger portions of barbecue, and drinks including craft beer and fancy sodas. For families, there will be children's activities and crafts. Organizers have also added “an event-wide scavenger hunt to keep the little ones busy while the adults talk barbecue,” according to Melissa Perez, the Communications and Special Events Manager of Historic Richmond Town. Staten Island's Corner House BBQ showed off its great pulled pork at last year's NYC BBQ Cookoff. I was able to go to 2018’s NYC BBQ Cookoff and had a great time sampling the food and meeting barbecue teams from around the Northeast. Last year’s event was a chance for Corner House BBQ in Staten Island to successfully showcase itself just before it opened to the public. If you decide to go, be sure to get there right when the gates open at 12 p.m., as the samples run out quickly. And if you go early, you might get a chance to mingle with the barbecue teams before things get crowded on site. Unfortunately, the event is not really accessible to New Yorkers who don’t have a car, and I had to take the Staten Island Ferry and then get a car service last year. I unfortunately won’t be able to attend this year due to being at the NBBQA 2019 conference in Kansas City, where I’ll be meeting with top barbecue minds from all over the country. 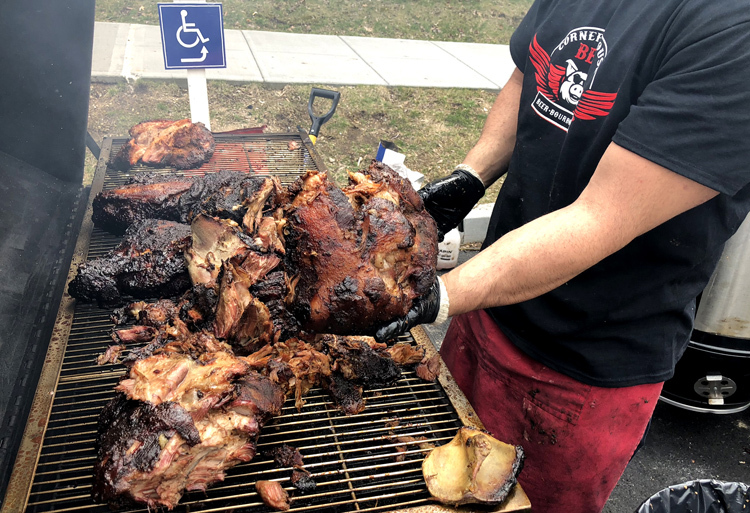 But if you’re a big fan of barbecue competitions and are able to get to Staten Island on April 6, you can try to some great food and get a rare look at some of the Northeast’s top teams. The Cornish hen at Blue Smoke is an intriguing new item at its Battery Park City location. 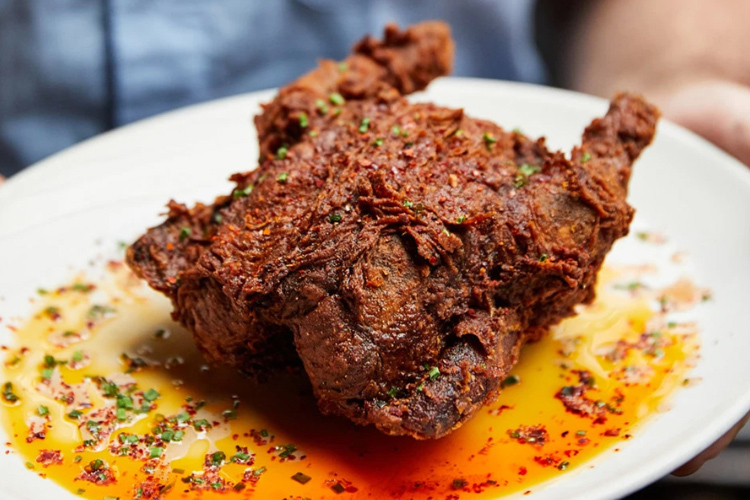 The New York Times’ Pete Wells, a notoriously tough food critic, heaped hot praise on Blue Smoke’s new smoked and fried Cornish hen. You can get it at Blue Smoke’s location in Battery Park City. New York staples Dinosaur Bar-B-Que, Hill Country Barbecue Market, and Brother Jimmy’s were highlighted in a new roundup from AM New York of top country restaurants and bars in NYC. The team behind Taino Smokehouse in Middletown, Connecticut has just opened a new location called Taino Prime in Meriden, Connecticut. It offers indoor seating for 260 people and specializes in prime steaks and open-pit barbecue. The entertaining list of the eight sloppiest dishes in Central Jersey includes all-you-can-eat ribs from Big Ed's Ribs in Old Bridge and the chicken wings at 2 Much Sauce in Plainfield.